1) The orbit of every planet is an ellipse, with the Sun at one of the foci. 2) A hypothetical line tethering a planet to the Sun will sweep out equal areas during equal periods of time. 3) The square of the period of the orbit is proportional to the cube of the semi-major axis of its orbit. Sounds easy enough, but there’s still some snags in there; for example, what is a semi-major axis? Why is the line covering equal areas such a big deal? And if we go around the Sun why isn’t it at the centre of the ellipse rather than “at one of the foci”? These are excellent questions, little Jimmy, and answering them goes a long way towards explaining why the solar system works the way it does. The semi-major axis of an ellipse is the longest line that can be drawn from the ellipse’s edge towards its centre. An object found at the point where the major axis intersects with the ellipse will be at the furthest distance from the centre possible. The semi-minor axis is the reverse; it’s the shortest line that can be drawn from the edge of the ellipse towards its centre. 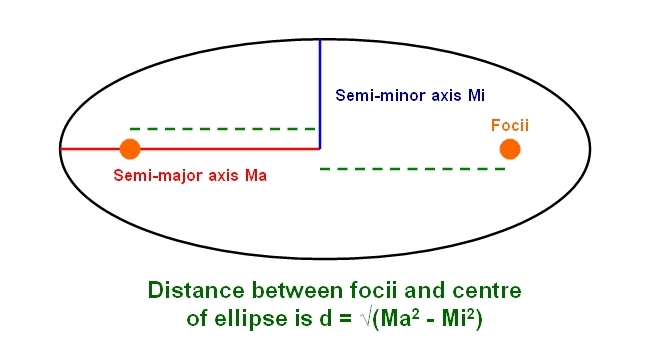 The focii of the ellipse are two points located on the major axis which are equidistant from the centre. Exactly what that distance is is calculated by subtracting the square of the semi-minor axis from the square of the semi-major axis, and then taking a square root of the total. 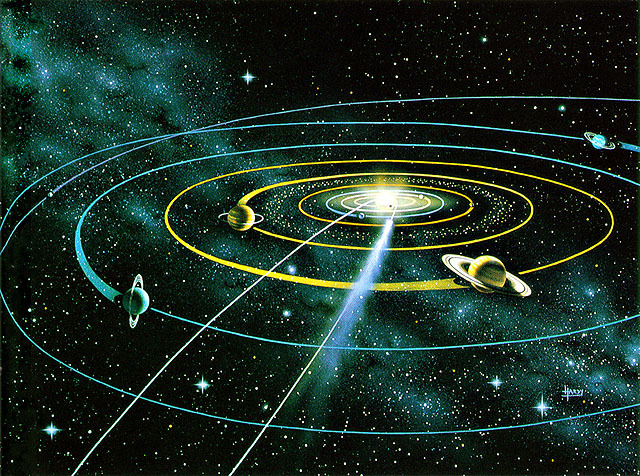 For bodies orbiting the Sun, it is always located at one of the focii of the elliptical path they follow. If you have a body orbiting in a circular (or practically circular) orbit, then the length of the semi-major axis will be identical to the length of the semi-minor axis, and the distance of the focii from the centre of a circular orbit will turn out to be zero — which is why we go around the Sun in a nice, orderly fashion instead of screaming in for a close approach on a highly elliptical path like a comet. Turning an orbit into a circle also greatly simplifies laws two and three; since a body on a circular orbit will always be at a fixed distance from the Sun it will always have a fixed velocity, and you can calculate its orbital period by cubing its distance from the Sun at any point, since that distance is always the same. However, while we can calculate the dynamics of circular (or near-circular1) orbits using laws intended for ellipses, not all orbits are circular. Comets and Kuiper belt objects in particular tend to follow highly elliptical orbits; comets will famously make close approaches to the Sun during which they display a prominent tail due to surface outgassing blasting off ice and other particulate matter before retreating to the outer solar system and beyond, and Kepler’s laws explain their behaviour too. This is the orbit of a hypothetical comet. As you can see it closely resembles the diagram of the ellipse with the Sun located at one of the focii, so that’s law one taken care of. Law two states that if we draw a hypothetical line between the Sun and the comet as it orbits around it, that line will sweep out equal areas in equal times. If you’re having difficulty visualising how this would work there is a neat animation on Wikipedia that illustrates it; the blue shaded zone always has a constant area, and each slice of the ellipse in the red zone also has the same area and represents the distance an orbiting body will travel over a fixed period of time at that point in its orbit. The equal area thing basically means that if the area swept out by the imaginary line is a function of the distance of the comet from the Sun multiplied by the comet’s velocity, and if that area is always constant over a given period of time, then in order to keep that area constant as the comet’s distance from the Sun increases and decreases over time the velocity of the comet must increase and decrease too. When it is far away from the Sun the comet’s velocity will be small. When it is at its point of closest approach the comet’s velocity will be at its fastest. This is a geometric representation of the comet converting gravitational potential energy into kinetic energy — and thus additional velocity — as it falls in towards the sun, and then losing that kinetic energy again as it moves outwards against the pull of the Sun’s gravity. The second law therefore tells how how the the velocity of an orbiting body will change as its distance from the Sun changes, which is crucial for plotting exactly where a comet or an asteroid is going to end up at a given point in the future. When astronomers find an Earth-threatening asteroid, Kepler’s second law is one of the things they’ll use to figure out if it’s going to hit us or not. The velocity of a body in a circular orbit is a single, constant number which is also determined by the distance from that body to the Sun. In other words, if you’re X million kilometres away from the Sun there is only one velocity you can travel at to achieve a circular orbit; travelling faster than this will cause your orbit to shift outwards into an elliptical shape (or maybe even escape the solar system entirely), and travelling slower than this will cause you to fall inwards towards the Sun. This is best contextualised using the hoary old analogy of the cannon on a mountain firing a cannonball around the Earth. If it’s travelling too fast it’ll escape the Earth’s gravity and fly away from the Earth; too slow and it’ll succumb the the Earth’s gravity and crash into the surface. It needs to be travelling at a velocity that is just right in order to achieve a stable orbit. This means that for each planet orbiting the Sun there is only one velocity it can possibly be moving at, determined by how far away from the Sun it is. 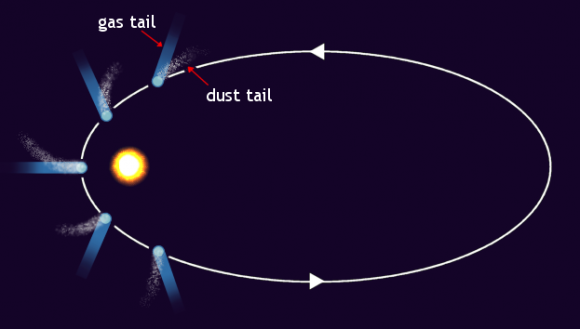 This velocity decreases the further away from the Sun you go, with the orbital velocity of Mercury being 47.87 km/s compared to the orbital velocity of Neptune, a mere 5.42 km/s. Being able to calculate typical orbital velocities from just how far away from the Sun a planet or an asteroid is is very useful for several branches of solar system science; I’m most familiar with it as a way of estimating impact velocities — and consequently how destructive they’re going to be — as while these will vary depending on the direction of travel of both the impacting body and the body being impacted (head-on collisions are obviously more energetic) it’s perfectly possible to get upper and lower bounds from models based on Kepler’s second law. (For your information the typical impact speed of an asteroid hitting the Earth is likely to be between 10 and 70 kilometres per second, which is fast enough for even a small chunk of rock to really mess up somebody’s day. If you’re dealing with stuff in the Kuiper belt the range of impact speeds is much smaller — around 1 to 9 kilometres per second — since everything out there moves so slowly.) So again, Kepler’s laws aren’t just for orbital dynamics; they’re also useful for figuring out how we’re all going to die in some horrifying apocalyptic nightmare scenario! This is super interesting. I don’t have much to add beyond that alas but it does neatly subvert a long-held assumption I had about, you know, planets. I didn’t like the way this post turned out (far too wordy and not good at providing the appropriate mental image of what’s going on) but it’s good to know the effort wasn’t entirely wasted.